Camp for €20,- a night at Mannix Point Park in low season with CampingCard ACSI. 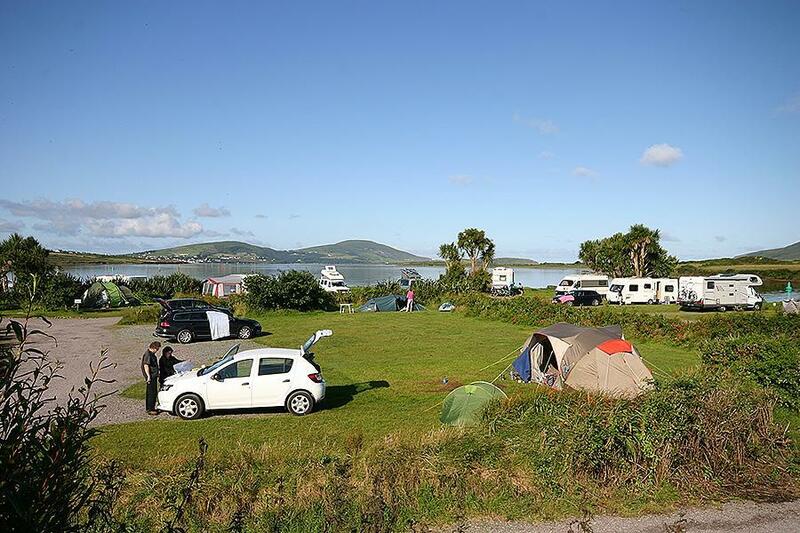 Mannix Point Park, located in Cahersiveen (Munster), is a campsite with 42 touring pitches. With your CampingCard ACSI you can camp on one of the pitches during the following periods: 24-04-2019 - 02-05-2019, 07-05-2019 - 31-05-2019, 04-06-2019 - 26-06-2019 and 01-09-2019 - 15-09-2019. At this campsite you can not only use your CampingCard ACSI for inexpensive camping, you can also use your ACSI Club ID (as an alternative ID). Mannix Point is located on the furthermost point of Europe and looks out over the bay and island of Valentia. The Gulf Stream ensures it has a mild climate. The campsite has already won 19 prizes and commendations. Come and visit us and see why. The staff were friendly, helpful and resourceful problem solvers. The facilities from showers, toilets, kitchen, to laundry were clean and pleasant to use. The Valentina Harbour vows are excellent. what a superb welcome from the owner, the site is an absolute gem, well looked after and all you need right on your doorstep, the campers lounge and kitchen are a great asset to everyone travelling light. I would recommend it and hope to go again in the future. Stayed Nov 2015, even though campsite was officially closed, Mortimer made us very welcome, lit a peat fire in the campers lounge. What a beautifull spot, excellent facilities, don't miss this one! Extremely friendly, helpful and knowledgable owner & staff. Toilets always clean and tidy, nice lounge area which we did not use but great for campers. A great pitch adjacent to beach & overlooking Valentia Island. Friendly town and an easy 10 minute walk to great pub's and eating establishments. Our first visit, thank you Mortimer and all. A really great site. Especially the views and friendly atmosphere. Our waterfront pitch had palm trees and spectacular sunsets. We joined a really nice music evening. The pricey washing machines had some unreliable functions. And a shortcut walking path to nearby village was missing. Would you like to book Mannix Point Park or request more information? You can do both using the information below. N70 from Killorglin to Cahirciveen. Through the town of Cahirciveen, right by the sea, ± 500m from the N70. CampingCard ACSI will send your information request to "Mannix Point Park".